The press release issued on the U.S. Producer Price Index (PPI) data calculated by the Bureau of Labor Statistics (BLS) highlights only a small subset of all the series generated. There is a much larger (i.e., 185-page) monthly report that features thousands of entries. Many of them pertain to construction. This article is based on the fuller range of material contained in the bigger PPI report. In calculating a price index for a good or service, the initial step is to choose a base period and set the real-world price at that time equal to 100.0. Then each subsequent monthly price is expressed as a ratio of that ‘base’ price. For example, if the real-world price rises by 8% in a year, its index value will advance to 108.0. If the real-world price drops by 2% in a year, its index value will recede to 98.0. The PPI numbers are known as ‘factory-gate’ prices. They are what producers or providers charge for their goods or services when they ‘go out the door.’ They do not include later transportation or wholesaling fees. (Transporters and wholesalers have their own ‘factory-gate’ prices.) They do include material, labor and margins. The PPI series are limited to domestic sources. Imports of equivalent products are not covered. Some imports, augmented by tariffs, however, will appear indirectly in the material component of factory-gate prices. Accompanying Table 1 has three sections. The top portion focuses on ‘final demand’ prices for all construction; for ‘private’ versus ‘public’ construction; and for five type-of-structure categories. ‘Final demand’ reflects the prices paid by owners for the construction of their projects. The middle (unshaded) section is for services, commodities (materials) and energy components essential for construction. The bottom block bundles goods and services as ‘inputs’ into specific kinds of construction. These are the costs − exclusive of capital investment (i.e., machinery and equipment purchases), final-stage labor and final-stage imports − faced by contractors. The year-over-year (y/y) price movements for ‘final demand’ construction at the top of Table 1 remain reasonably restrained. 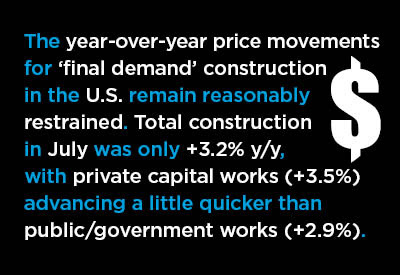 Total construction in July was only +3.2% y/y, with private capital works (+3.5%) advancing a little quicker than public/government works (+2.9%). The ‘final demand’ price advances for the five type-of-structure categories highlighted in the upper section of Table 1 range from a low of +2.6% for warehouses to +3.8% for office buildings. The ‘input’ indices at the bottom of Table 1, however, tell quite a different story. While the PPI’s ‘final demand’ construction price indices (top section of Table 1) are still being held in check, the ‘input’ indices (bottom section of Table 1) are rapidly shifting to higher ground. The PPI’s ‘inputs to new construction’ index is presently +8.1% y/y. The ‘goods’ component of those inputs is +9.4%; the ‘services’ component, +6.4%. The other y/y price increases in the bottom portion of Table 1 are also displaying notable large jumps. Inputs to new residential construction are +8.1% y/y, with multi-family housing (+8.3%) a stride or two in front of single-family housing (+7.9%). Graph 1 shows the monthly y/y percentage-change history, January 2000 to the present, of the ‘goods inputs to new construction’ index. Since September 2015, almost three years ago, the figure has shot up from -5.1% to close to +10.0% most recently. The cost index for ‘goods inputs into construction’ is now racing ahead at its fastest rate since September 2008’s +12.4%. But that elevated rate of +12.4% a decade ago resulted from an artificial boom in homebuilding that was fueled by faulty subprime mortgage lending. When those risky underwritings failed, and the Great Recession took hold, the ‘goods inputs to new construction’ price index collapsed to -8.2% in the summer of 2009. The last data point is July 2018. Data source: U.S. Bureau of Labor Statistics (Producer Price Index/PPI series).